Tactical Electronics deployed the CORE Camera Systems at Operation Convergent Response in Perry, Georgia earlier this month. 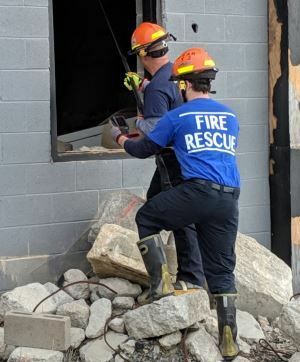 Hundreds of first responders and search and rescue teams gathered at the Guardian Centers to learn how the industry’s latest technology can be used to help save lives. We were thrilled to be a part of such an impactful exercise and happy that our technology could be utilized to help search and rescue teams. The CORE Pole Camera and CORE Flex Cameras were the most popular pieces of gear at the exercise. Below you will see real-time footage from the cameras, as well as thermal video that showcases our unique Thermal Fusion Technology. In the first video clip, using the CORE Pole Grip with Flex Camera, you will first see the impressive setup of the Guardian Centers. This is an excellent training center with a state of the art campus, perfect for first responder training. The operator then uses the CORE Pole Grip with Flex Camera to inspect the inside of crushed vehicles from a collapsed parking garage. The Pole Grip is available in 10 ft or 17 ft lengths and can easily be extended or shortened to your desired length. The Flex Camera has a flex and stay neck that allows you to easily position the camera and access tight spaces. The modularity of the CORE Camera line allows you to quickly hot swap camera heads, so you can choose the best camera for your current mission. All CORE Cameras send live video to the CORE Monitor or to a mobile device using the CORE Android app. Operators were impressed with the flexibility of the system and the wireless design. The CORE Camera line has an extensive list of features, but the Thermal Fusion Technology feature is clearly one of the most impressive to our customers. Unlike standard thermal imagers, Thermal Fusion Technology allows you to see subjects, objects, and barriers with thermal colors and clearly defined outlines. In a search and rescue operation this could mean being able to clearly identify a body from an object, or clearly identify the type of barrier that is obstructing access to an area. All of the technology demonstrated at Operation Convergent Response is extremely beneficial to search and rescue teams. We are very thankful to be included in such a great event and look forward to returning in 2019. If your Search and Rescue team would like to learn more about our CORE Cameras or SAR equipment please request a demonstration here.